Tumeric is the most important ingredient in curry powder. It has a yellow orange color that it’s recognized for. Tumeric was associated with the sun in the mythology of Hinduism. It plays a very important role in Buddhist and Hindu Ceremonies and is associated with purity, prosperity, and fertility. It is also said to bring good luck when applied to a bride’s face! It is believed that the clothes worn by the gods of Hindu mythology were dyed in tumeric. Tumeric powder comes from a perennial reed-like plant of the ginger family that is native to India. You might want to add tumeric to your hex prevention magic spells and food spice rack. Tumeric is a common herb from Asia that can be found at the local grocery store. This herb has built a reputation of being a powerful antioxidant. The herb has been in the limelight as a food seasoning that helps fight cancer including pancreatic cancer and liver cancer. It is also an anti-inflammatory. Curcumin is the active ingredient in tumeric and it is part of the ginger family. 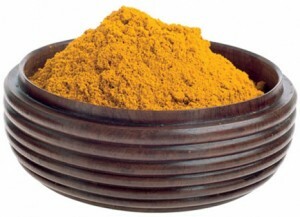 Curcumin is commonly used in spicy curry and for the natural yellow color. If you are allergic to ginger you should not have tumeric either. Including spices into your natural diet is often thought safer than taking supplements. Supplements have such high doses you can venture into a situation where you start to get negative side effects from the pills. Try to include a variety of spices into not just your magic spells but your cooking as well. Tumeric can help protect against liver diseases, reduce your cholesterol, prevent aging, heart disease, dissolve blood clots, promote sleep, lesson menstrual pain, stimulate the circulatory system and gallbladder and help stop internal and external bleeding. It also may help reduce the symptoms of colitis and Chrohn’s disease as well as diffuse illnesses from parasites and bacteria. There have also been studies that show that it helps stop tumor growth. Tumeric also is used as an ingredient in beauty creams that treat conditions such as psoriasis. Obviously, it’s not going to cause an overnight miracle, but its good to know that including herbs like tumeric into your diet can help to protect your body and anti age you. You can find tumeric in the spice section at the local grocery store (it also comes as vitamins too). Using tumeric as a spice in your food and cooking yet don’t consume too much of it so as to cause negative side effects. You can get the black pepper and tumeric mixed spice. Witches often add tumeric to warm milk as a quick and natural means to regulate the menstrual cycle and cramps. Tumeric is a very common ingredient in Hex preventer spells as well. These are spells that prevent hexes from being cast against you. The tumeric is turned into a yellow paste by adding water which is used to write symbols as part of a spell. If you know the name of the person trying to hex you the yellow tumeric paste is used to write their name as part of the hex prevention.